Bex finds the proper vicar’s daughter and her most improper proposal endlessly amusing—and attractive. But, saddled with debt, he’s in no position to keep a woman, much less marry one, which is what a woman like Lucy deserves. Little does he know that even with her reputation at stake, Lucy will take the biggest gamble of her life by following her heart—straight into his arms . 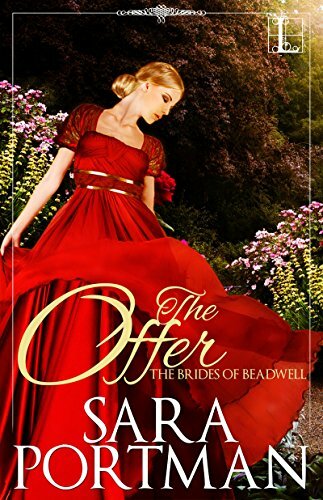 . .
As you know this is the second book in the Brides of Beadwell. This time the story concentrates on Lucy Betancourt who if you remember is the best friend of Emma and John's cousin Bexley Brantwood. Again I can highly recommend this book, this series is an absolute must read. As with all good books we have the baddie and in this book we have two and of course we have a hero who has underlying problems and heroine who feels she doesn't fit in society, and then Lucy comes up with a plan much to Emma's disapproval. Lucy feels that at twenty-four she has missed getting married because the men in the village are either too young or too old and her parents haven't got the funds for Lucy to have a season and she also doesn't have a dowry to offer. Now you may remember that Emma and Lucy are childhood friends and Lucy often took lessons with Emma when they were children. But Lucy feels she has now become a burden on her parents, her father is the local vicar and because he has reached an age were he needs extra help he is looking to hire a curate, so Lucy thinks she has leave her parents home. So Lucy has come up with a plan to either become a companion or a governess. Now please bear in mind that this what Lucy thinks and she hasn't voiced this too her parents. Now Lucy is telling this to Emma who is emptying her stomach (I know gross) at the time...but Emma is expecting a baby and has asked Lucy to stay with her and John until the baby is born. So poor Emma is trying to relax while Lucy is telling her of her plan, much to Emma's disgust, and to be honest mine as well. Lucy is far too good and to inquisitive, to go into any of these positions. Now we come to the man that changes Lucy in more ways than she thought, this man is Bexley Brantwood cousin to John, I did love how they first meet when Lucy goes into the drawing room to collect her book and she thinks she is talking to Lord Ashby about a position of governess and Bex is thinking that Lucy is offering herself as a mistress, this for me was toeing curling and I wanted to go into the book and get Lucy out of the room. So back to Bex, he is man will a lot problems mainly how he is going to fund his investments without the funds to do so, that is mainly because his father got into debt, because if you remember John was missing presumed dead, so the dukedom would have fallen to Bex's grandfather who was next line to inherit. So Bex's father was shall we say annoyed that John returned and claimed his inheritance, but Mr Brantwood senior had got used to the finer things that society offered, so he used Bex's inheritance to fund this lifestyle. Now Bex doesn't find out about this until he asked by John to attend a meeting at Worley house and is confronted by his father and off course he had to admit what he done. This is were I loved Bex because he refused John's offer to pay his debts, the same couldn't be said of his father who took the money offered by John in his grubby hands. Now I hear you say they were two baddies, the first I have mentioned Bex's father. The second is a woman who I wouldn't want in my family. Too understand this woman I have to talk about Lady Constance who has recently returned to London after the death of her husband (she isn't the baddie), and she befriends Lucy and with a little encouraging she shows Lucy what she can do. Lady Constance has a niece called Annabelle and before Constance got married they would often correspond, but then when Constance married a french man and moved too France, the letters slowly stopped and by the Annabelle married they had stopped completely, and Constance was worried that her niece's husband had somehow intervened her letters. So she asked Lucy to go on a adventure with her to go to her niece's home, which they do and also Bex went with them as well, and Lucy and Bex had to pretend to be married. I hear you say will you please get to the point. Alright then, Annabelle is so awful and very disrespectful of her Aunt and Lucy is mortified on Lady Constance's behalf . There is more to this bit of the story and I don't want to spoil it too much. So there we have it. Lucy's story and this is a absolute must read. I will give this book 5/5 stars. The last book in the series is The Chase, the character in this book made a fleeting appearance in the first book. So if you have read the book then you should remember Juliana Crawford. You can purchase this book from Amazon on 24th October.